It does seem like going over old ground again and again and again. Science deniers keep repeating the same tired denialisms again and again and again. It's happened on two anti-science blogs today, at Judith Curry's blog and at Anthony Watts' blog. Anthony Watts is, I think, trying to argue that because New Orleans is still on the map, then climate science is a hoax. 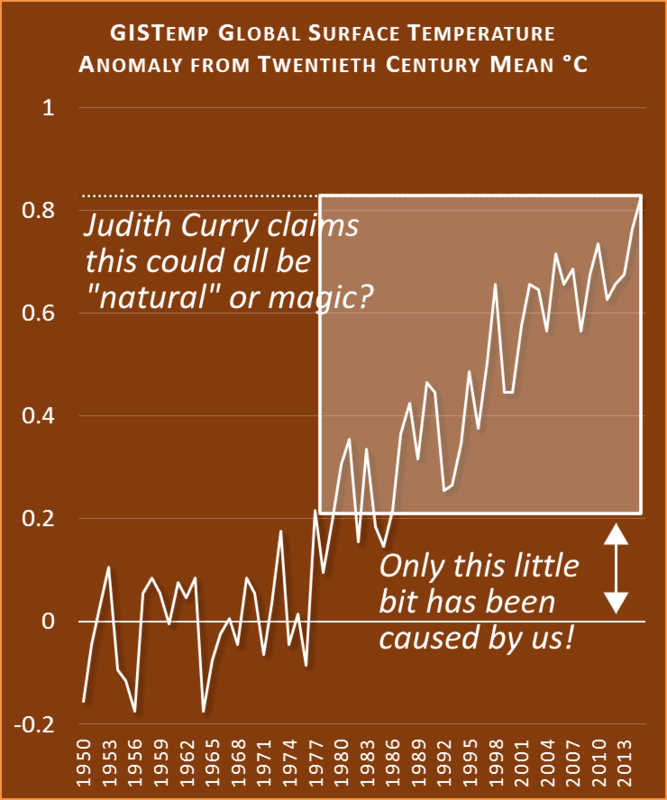 Judith appears to be trying to argue that most (75%) of the warming since 1950 was caused by magic. Okay - I exaggerate a tad, but not much. See if you agree. The first one is easy to counter, because Anthony Watts does it himself. He builds the strawman that someone said there were going to be more hurricanes so he can knock it down (archived here). Science doesn't say unequivocally whether there are going to be more or less hurricanes and tropical cyclones. It's not been resolved what will happen as global warming kicks in. An increase in global mean frequency during roughly the first three quarters of the 21st century is indicated, with a total increase in the range of 10-40%. ... most of the increase in frequency is in the North Pacific, but with substantial increases in the North Atlantic and South Indian oceans as well. The only coastal region that experiences a substantial decline in track crossings is the southeast coast of Australia. The differences between our results, those arrived at by applying the same technique to CMIP3 models, and the conclusions of other groups using different models and/or using different methods suggest that projections of the response of tropical cyclones to projected climate change will remain uncertain for some time to come. Deniers do have a tendency to make up stuff about "what the science says" so that they can knock it down. It's a logical fallacy of the strawman type, and is Telltale Technique No. 2 of climate science denial. Anthony doesn't even bother saying what more or less hurricanes mean in regard to global warming. Nor does he discuss severity vs frequency. One can speculate that the message he is trying to convey is that there has only been Hurricane Sandy to rival Katrina in the past ten years in terms of damage in the USA, therefore climate science is a hoax. Pretty dumb, hey? Next comes denier Judith Curry (archived here). She is disputing the cause of global warming, (as well as trying to play down the fact that almost all scientific papers that attribute a cause to warming, say its because of human activities). She's turning (or turned) into an utter nutter denier. Based on the well constrained attributable anthropogenic trends shown in Figure 10.4 we assess that anthropogenic forcings likely contributed 0.6°C–0.8°C to the observed warming over the 1951–2010 period (Figure 10.5). Figure 10.5 is shown below. 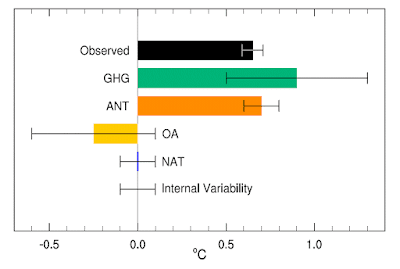 As you can see, at the time of AR5 it was estimated that internal variability and natural forcings each contributed zero to global mean surface temperature, with an uncertainty range between -0.1 °C and +0.1 °C. 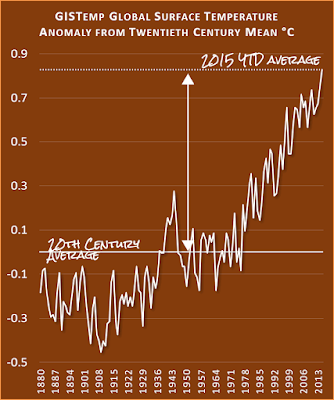 While all anthropogenic forcings contributed more than the observed increase in temperature. Greenhouse gas forcings were counteracted to some extent by negative forcings (primarily aerosol). The uncertainty around the contribution of greenhouse gases and "other anthropogenic forcings" are the largest. But the greenhouse gas forcing is far from negative. None of this is new. 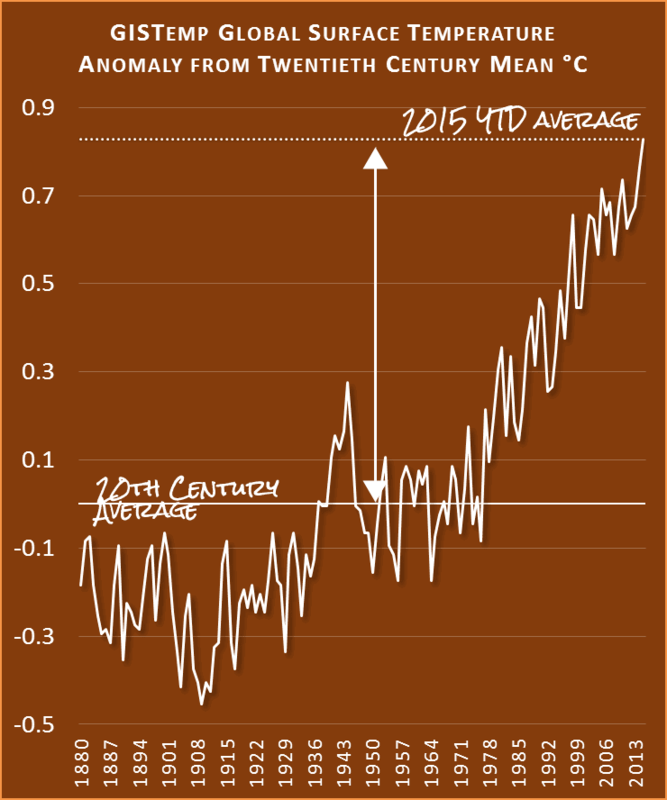 Climate scientists know that the world is warming because of human activity. Well most of them do. It's only deniers that dispute that, but they have nothing to replace it with. 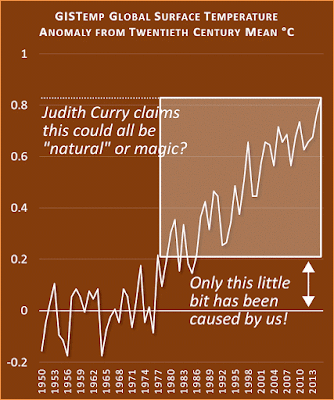 Judith Curry: "magic" caused global warming? Judith Curry in a comment to her latest blog article, said that she thinks that only 50% +/- 25% of the rise in global mean surface temperature since the mid-twentieth century can be attributed to human activity. Now look at it in the context of the entire period since civilisation began. Over thousands of years, the global mean surface temperature has probably never been as high as it is right now. So what on earth does Judith Curry think could have happened to make "natural" influence suddenly behave so differently to the way they've operated in the past 10,000 years or so. I've shaded an area to show the rise in global surface temperature that Judith Curry thinks might have been caused by something other than human activities - 75% of the warming since the middle of last century. Even the highest temperatures of the Holocene took a heck of a lot longer than six decades to reach the maximum. There's nothing that could explain the sudden dramatic increase in global surface temperature other than the rapid increase in greenhouse gases. Judith doesn't say what she thinks caused the other 75% to 25%, nor where she got her numbers from. Nor does she explain why she's got that huge, gigantic margin around her wild guess. In other words, we can take it that what she wrote wasn't based on any understanding of science. It was a wild guess. A flailing about. No research required. She might as well claim it's between -100% and +100%. Or between none and all. Do you think perhaps Judith thought for half a second to settle on what she figured might give her an "out" with both scientists and fake sceptics? If so, I'd say she lost. She lost with the scientists because it shows that she doesn't read science. She lost with the fake sceptics because they don't believe that the earth has warmed, let alone that humans had any hand in it. Since Judith isn't inclined to offer any evidence or even a hypothesis for the number, which I'll make my own wild guess was plucked out of thin air, I figure I'll try some myself. where is that warm water supposed to have come from and how did it get so hot? why is it so much hotter than it was the last time the AMO was positive? how did the world stay so warm when the PDO was in its cool phase recently? I've written before about work that shows that the AMO doesn't contribute a lot to global surface temperature fluctuations - here and here. And the PDO is probably just coming out of a cool phase. If warming was caused by "natural" oscillations in the Pacific ocean, then it should have cooled the world recently. Instead it continues to get warmer. I'd have thought that deniers might have tried to come up with some consistent "denial" message in preparation for the Paris talks later this year. You know, like tossing snowballs on the floor of the UN building and claiming that it's proof that an ice age is coming. Instead they are just re-hashing inconsistent old denier memes that don't make any sense. And showing how they don't read science. They've still got time, I suppose, to steal some more emails and distort them in a re-hash of the CRU theft. Or maybe they've given up and have decided to drop any pretence at being rational human beings. When you've got Judith Curry favouring a denier blogger over thousands of scientific papers, it's a fairly good sign that she's given up. Anthony Watts is not showing any creativity either. He never has. Judith Curry? "Consulting fees" - there, I've said it. "Here Judy, thanks for the consultation. Spend it any way you want and feel free to stall action against oil any way you want." If I was to choose between stupidity and conspiracy, I'd choose the former - evidence being the quality of Judith's blog articles, or lack of. World view comes into play, too, obviously. Just look at who she cites, with no sign of her critically analysing her favoured sources. Evidence, logic. reason and critical thinking are noticeable for their absence in Judith's articles, as they are at WUWT. What's the word for when one sells one's services for money and in the process compromises one's integrity? Except for the obvious candidates (deniers for hire who are employed by the anti-science lobby groups, like CATO, Heartland etc), or where there's direct evidence, I don't see any point in speculating that anyone gets paid to lie about climate science. These days it's probably a more lucrative proposition to help businesses plan for climate change than to try to get money from clients who want to deny the inevitable (professional lobbyists excepted, but that wouldn't be an easy game to break into). Somewhat warped ideology and a predisposition to conspiracy ideation, or a tendency to right wing authoritarianism is much more likely. (Distrust of society, absurd fear of normal experts/authorities etc). Oh that word would be Tea Party, also known as Total Environmental Amnesia Profits All Republicans' Trophy Yachts. I'll email John Christy, he's got an answer for everything. The AGW consensus has constructed on a foundation of a vast amount of data, a simple basic physical model and a pair of main driving mechanisms (increased GHGs and changes in land cover). In contrast, the deniers are limited to a few cherry-picked partial observations and, apparently, the driving mechanism of magical climate elves. Just noticed an article in Time about hurricanes, and why global warming will make them worse - because of rising sea levels. That'll affect the east coast of the USA because of how it's going to get higher seas than most (with West Antarctic melting plus land subsidence IIRC), and is also prone to hurricanes. Sou, you're such a wonderful person. Did I ever mention here that according to my neighbors around me there are defense department and contractor big whigs buying land and building in the Ozark Highlands of Missouri and Arkansas? Think I've only told a few people in our company. Wall Street tycoons have bought up land with caves and/or building underground homes. They've blocked access to caves. "The only coastal region that experiences a substantial decline in track crossings is the southeast coast of Australia." I don't recall there ever being a hurricane (tropical cyclone) coast crossing in southeastern Australia - I could be wrong though.